A lightweight scrap between former division title holder Anthony Pettis and perennial contender Jim Miller has been added to July’s UFC 213 pay-per-view event in Las Vegas. BJPENN.com’s Chris Taylor confirmed the news with Miller himself, this after an initial report from Brazilian news outlet Combate. 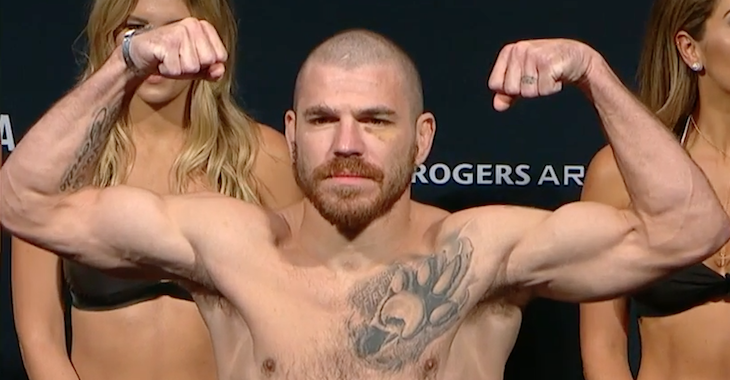 Jim Miller was last seen in action at February’s UFC 208 event in Brooklyn where he suffered a decision loss to Dustin Poirier. Prior to the setback, Miller had reeled off three-straight victories over Takanori Gomi, Joe Lauzon and most recently Thiago Alves. The lightweight veteran, Miller, holds a professional mixed martial arts record of 28-9. Meanwhile, Anthony Pettis was most recently seen in action at UFC 206 this past December, where he suffered the first TKO loss of his career at the hands of Max Holloway. “Showtime” failed to make weight for his interim featherweight title fight against “Blessed” at UFC 206, and has now opted to return to the promotions lightweight division which he once ruled. Anthony has gone 1-4 over his past five fights, with his lone victory in that time coming via submission over Charles Oliveira this past August. Who do you think will emerge victorious in this exciting lightweight scrap between Miller and Pettis? Earlier this morning, news broke that Anthony Pettis had missed weight for his interim featherweight title fight with Max Holloway, which was scheduled to serve as the main event of Saturday night’s UFC 206. Now that the dust of Pettis’ unfortunate weigh-in miss has settled, the UFC has announced how it will proceed with the bout. Having missed weight, Pettis will no longer receive the interim title if he defeats Holloway. As a former UFC lightweight champion, his winning this title would have made him the fourth fighter in UFC history to hold titles in two weight classes, alongside Randy Couture, BJ Penn, and Conor McGregor. As such, this is all bound to sting quite a bit for him. Pettis will also forfeit 20% of his purse for this weigh-in miss. These updates come from ESPN’s Brett Okamoto, who spoke to UFC President Dana White in the wake of this ordeal. 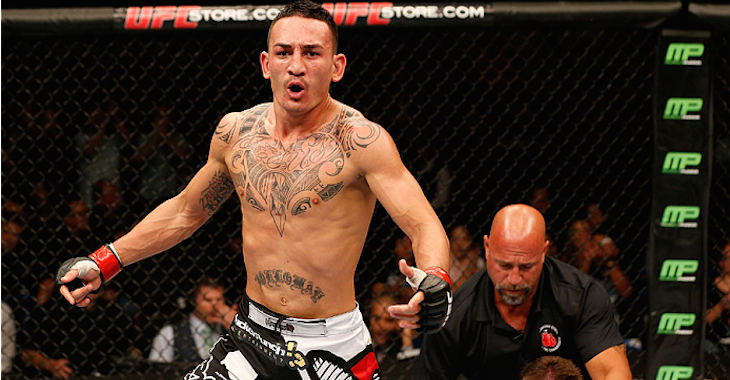 Per Dana White, it is still an interim title fight for Max Holloway. Told Pettis forfeits 20 percent of his purse for missing weight. While Pettis will no longer have the opportunity to win interim featherweight gold, Holloway will still win the belt if he comes out on top. In sum, the only thing that changes with respect to this fight is that Pettis has lost his chance to become the interim featherweight champion. In addition to this strange main event, UFC 206 will also feature a welterweight bout between fan favorites Donald “Cowboy” Cerrone and Matt Brown. The bout will mark Cowboy’s chance to move to 4-0 as a welterweight, and Brown’s chance to rebound from a KO loss to Jake Ellenberger. Other highlights of the card include a middleweight bout between Tim Kennedy and Kelvin Gastelum, a featherweight bout between Cub Swanson and Doo Ho Choi, a welterweight bout between Emil Meek and Jordan Mein, and a light heavyweight bout between Nikita Krylov and Misha Cirkunov. When Daniel Cormier was forced to withdraw from his planned light heavyweight title fight with Anthony “Rumble” Johnson, it left Saturday night’s UFC 206 without a main event. To rectify this situation, the UFC enacted a multi-part plan: First, they stripped Conor McGregor of the UFC featherweight title. Then they promoted interim featherweight champion Jose Aldo to undisputed champion. Finally they announced that UFC 206’s co-main event, a featherweight fight between Max Holloway and Anthony Pettis, had been promoted to the main event spot, where it would crown the new interim featherweight champion. In the moments before Pettis took to the scale, Pettis’ coach Duke Roufus was able to confirm to BJPenn.com that his fighter would not make weight. Shortly thereafter, Pettis hit the scale, clocking in at 148, three pounds above the contracted weight of 145 pounds. Despite Pettis’ weigh-in miss, precedent suggests Holloway might still be crowned the interim champion if he wins. At the time of this writing, however, it is not known if this will actually be the case. Regardless, Holloway doesn’t seem pleased by this ugly twist. Are you surprised that Pettis failed to make weight? The octagon returns to Toronto, Ontario, Canada this Saturday for the UFC 206 pay-per-view event. The event is headlined by an interim featherweight title fight between streaking contender Max Holloway and former lightweight title holder Anthony Pettis. Max Holloway is currently riding an ultra impressive nine-fight win streak, his latest being a unanimous decision victory over Ricardo Lamas at UFC 199 in June. “Blessed” has scored six finishes during his current nine-fight win streak. Meanwhile, Anthony Pettis is coming off a third-round submission victory over Charles Oliveira in a bout that served as his featherweight debut this past August at the UFC on FOX event in Vancouver. Prior to that, the former lightweight tile holder suffered three-straight setbacks in a row to respective opponents Rafael dos Anjos, Eddie Alvarez and Edson Barboza. “Showtime” will be looking to become the fourth fighter in UFC history to win belts in two different weight classes by defeating Holloway on December 10 in Toronto. Who do you think will leave Toronto with the interim featherweight title at UFC 206 this Saturday night?